Day 9: Sabi Sands to Agatha Coach House - The day began well before dawn - a 5.0am reveille. 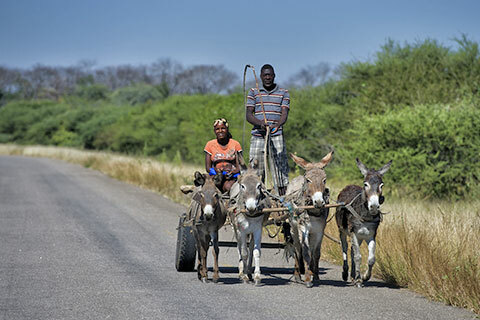 Everyone is taking part in their final game drive before getting behind the wheel and moving onwards. We were back at camp three hours later, crews reunited around the breakfast table to swap stories of yet more rhino, lions and leopards, and today's newcomers, several honking and belching hippos. After another extensive al fresco breakfast on the terrace, we threw our bags into our cars for the drive of 300kms to Agatha Coach House, a collection of Dutch gabled white-washed Old Colonial cottages set amid magnificent gardens with rolling lawns bordered by flowering wisteria and colonnades of matching blue milk-maids. Our drive took us down arrow straight roads, through several villages and a rocky canyon. Some of us took time out to stop at a roadside scrapyard to inspect the remains of two old Mk2 Ford Escorts, one four-door with a fairly sound body ripe for restoration is up of sale at £400. A red two door, looking much worse, was a fraction of that and we even found a Peugeot 504 in drive away condition - start bargaining at £1,500. With that little distraction over we returned to the job of pounding down yet more hot bitumen. Orange and mango plantations along with commercial forests lined the route as we climbed up through the green hills to the lovely old Agatha Coach House. Over tea on the lawns, the happy crews exchanged experiences of the past 48 hours. All, that is, except Judy Washington and Zoe Lovett, who began setting up an evening of entertainment with hilarious party and parlour games. Quite how Maria de Sousa came to be blindfolded and feeding Rally Director Philip Young jelly and custard (while also blindfolded), and quite how Janet Howle ended up riding around on Philip's back is probably best left unreported. The star of Judy's show was undoubtedly Gina Long who, we can reveal ended up well mummified with a thick wrapping of toilet paper. Day10: Agatha Coach House to Mapungubwe Camp - A misty start for us today meant that the stunning views of the previous evening remained hidden. A swift exit from the hotel was followed almost immediately by a short Medal Section on a hard murum - red dirt - track through a eucalyptus plantation. 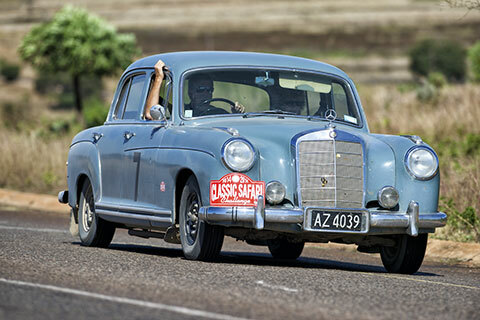 Under increasingly blue skies, Peter Lovettt set the best time in his white Porsche 911; Dennis Varney was second in the Ford Falcon, with the Lancia Fulvia and 1800 Landcrab trading seconds. A notable effort was also put up by the Mustang of Mike and Eunice McInerney who set a surprising pace given that much of the course was twisty… The big V8 was a couple of seconds behind the Lancia driver Gianmaria Aghem and Rossella Conti, who won the gold medals. Our day ended at a Safari Lodge of tiny thatched cottages and another tasty BBQ. Day 11: Mapungubwe Camp to Matopos Camp - Another early start today due to a border crossing - South Africa into Zimbabwe via Beitbridge. The three Zimbabwe Tourist Authority guides the ERA had tasked with ensuring the safe passage of the Rally swung into action. Carnets, immigration documents and insurance policies were filled out, handed in and duly stamped and we must thank our partners for their invaluable help here. The day was not over at the border though, as there were some serious kilometres to get through and once the border was cracked the Rally got down to business on some surprisingly good roads under a broiling sun. Finally we arrived at the end of a long and dusty day to a tented encampment in a game park just outside of Bulawayo under the big African sky just as the sun was setting. With their cars in good order, many of the crews took time off for a stiff walk up the side of a rocky hill to watch the sunset from a World Heritage Site and see the grave of Cecil Rhodes, the Victorian explorer and entrepreneur who founded Rhodesia, now named Zimbabwe, and a man who almost completed his vision of linking up the entire length of Africa with a railway. We dined together with tables lit by candles under a starry night so clear we could even pick out the Southern Cross from the vast constellations above our heads… The Milky Way covered our campsite in the crisp clear air, confirming that our only night under green canvas tents, set up for us by Forever Africa, would be chilly one. 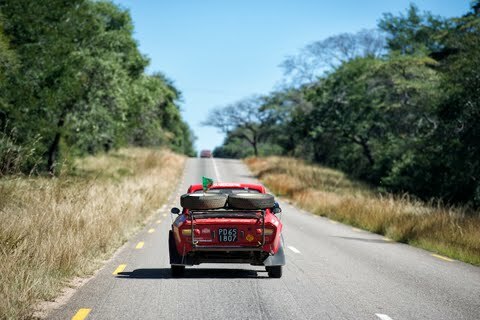 Day 12: Matopos Camp to Victoria Falls - To the sound of 40 or so zippers being reluctantly slid open, the Rally emerged blinking into the dawn, ate a hearty breakfast and got back on the road. Today's prize though was worth the effort. At the end of a long haul that took us from Bulawayo to Victoria Falls, we pitched up at an oasis of calm, the whitewashed Victoria Falls Hotel. With its rising spray - the 'smoke that thunders' - the world's largest waterfall can be seen from several bedroom windows and the lawn where Nikki Bannister is giving crews their room keys. It's been an amazing drive so far and this spot is just the place to sit back and reflect on the first half of it. We are in one of the top hotels in Africa and certainly the best in the vicinity of the Falls for two nights, tomorrow is a day off. Time for some domestic chores, some light maintenance and a bit of sightseeing.